Day One started on about 1 hour of sleep (I had played one of the Salsa Cruises with my band Tropicoso till 2am the previous night) and we were due at the airport around 7:30am. the freaking Cab driver shows up at 6:45 while I'm in the shower (sorry for that bad mental image there) and I have to tell him that he's gonna have to wait as a) I'm still dripping wet and b) Mom isn't even here yet! Eventually Mom arrives, we collectively curse his dispatcher and get to the airport. We had a quick 45 min flight to Chicago, a 2.5 hour layover (which I spent cruising up and down terminal A with my laptop looking for a wireless internet portal to send a last minute business email that had fallen through the cracks) and then 13 hours non-stop to Osaka, Japan. I had been dreading spending that much time in a plane but it really wasn't all that bad. They had 5 movies to choose from, were constantly pushing food and snacks to you (I think it was 3 meals, 2 snacks and 4 beverage runs). The plane was a Boeing 777 which was amazing. 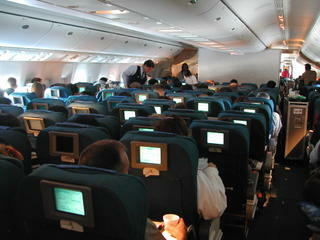 Every seat had it's own LCD screen for movies etc. 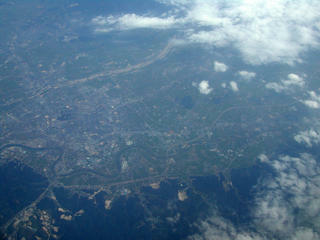 but they also had this cool map display showing your position on the Earth as we flew. 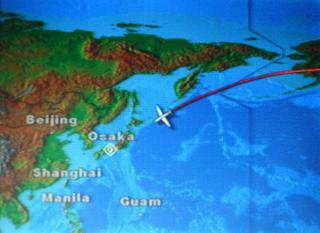 Our ground track took us up through Minnesota, Canada, on an arc which peaked right over Anchorage, Alaska. Then back down just to the west of that eastern Peninsula of the former USSR and down along the east side of Japan, then crossing over the island, down the west side of it for awhile before 'attacking' Osaka from the West. In spite of all the food, you really had to get up and walk around some (it was daylight the whole way) I got up and took some pictures out the rear window of the plane back by the galley.